Jamie Oliver: Ein Koch warnt vor CETA – Konstanzer Bündnis für gerechten Welthandel – gegen TTIP, CETA und TiSA! Auf seiner Webseite warnt der britische Koch Jamie Oliver vor den Folgen des EU-Kanada-Handelsabkommens CETA. Er zitiert dabei die Europäische Gesundheits-Allianz EPHA, die CETA ein „ungesundes Abkommen“ nennt, untersucht die Folgen für Herkunftsbezeichnungen von Lebensmitteln und kritisiert, dass Lebensmittel demnächst mehr Gift enthalten könnten. Leider ist sein Beitrag schon etwas älter – er wurde Ende Februar verfasst. On the heels of a wave of trade-block break-ups – TTIP’s death, growing rumblings of NAFTA’s unhinging and the unlocking of the UK’s trade options post-Brexit – it is Canada and the E.U. that are bucking the trend, finding common ground, and soon, common goods. After seven long years of negotiation fraught with controversy, the two trade blocks have cemented the ‘Comprehensive Economic Trade Agreement’ – aka. CETA. In a year that’s seen more borders lock-down – than open up – the deal is seen as a litmus test for global trade relations among old alliances. And is already being hailed as the ‘blueprint’ for future trade deals. But what does it mean for food, farming and health? In December, the European Public Health Alliance (EPHA) – an alliance of public health NGOs, professionals and patient groups across the UK & EU – put out a firm warning, saying the treaty could open the door for businesses to challenge health laws, limit public health, food and water policy choices, lead to lower tariffs on imports of unhealthy foods, and undermine measures to counter antimicrobial resistance. The alliance has since put out a statement calling the now approved deal ‘unhealthy’ for people and the environment. Speculation about the future impact of the deal remains; it’s now up to each market to prepare for the change and new rules. But since the deal’s confirmation earlier this month, the EPHA’s worries have been more vindicated than dispelled. Here’s what we’ve learned. And to keep in mind as the UK looks for its own global deals. Last week marked the final crossing of legislative T’s and dotting of bureaucratic I’s between Canada and the E.U. Lawmakers voted 408 to 254 to clear the way for CETA to proceed. Parts of the deal will enter into force as early as April 2017. 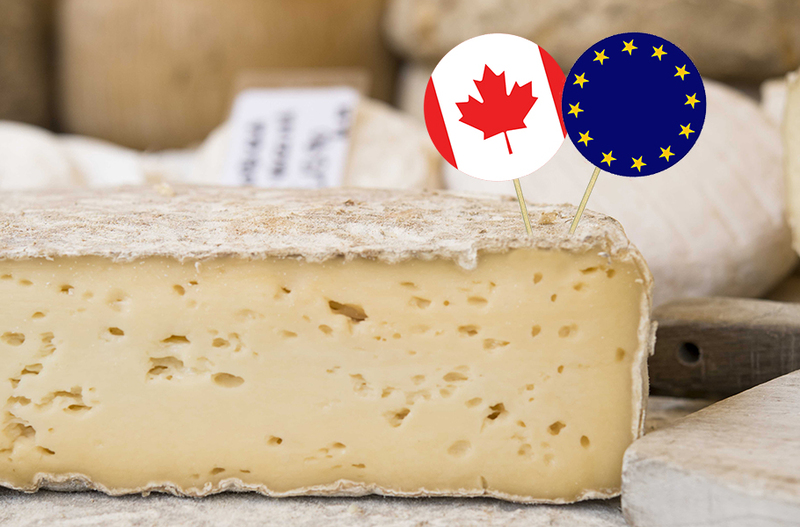 The agreement will double the amount of European cheese flying to Canada, to the tune of about 30,000 tonnes a year. Good news for EU cheese sales; incoming migraine for Canadian cheese makers who worry a sizeable bite may be taken out of their sales. To mitigate concerns, the Canadian government has said subsidies will be made available to cheese producers. The deal will also chip away at a trade barrier that currently protect wine and hard liquor, in a bid to make European booze less expensive for Canadians. This will raise the ire of Canadian wine makers who have been accustomed to greatly protected markets, even between Canadian provincial boundaries. In return for all of the cheese Canadians will be buying from Europe – Europe will grow a ravenous appetite for Canadian beef and pork. The EU has committed to buy 50,000 tonnes of Canadian beef and 80,000 tonnes of pork annually. The access will be phased in over time. Until the UK formally leaves the EU, it will be bound by CETA’s requirements and required to find new love for Canadian meat along with its European neighbours. In a bid to unite more deeply the markets of 35 million Canadians with 500 million Europeans, the deal will slash 99 per cent of tariffs, including those on farm and food items. It will also open up the services sector in areas like cargo shipping, telecommunications and financial services. That means vendors from the E.U. will be able to vie for Canadian contracts, and vice versa. Doing so will fatten the already ample investment flowing between the two trade blocks. The E.U. is Canada’s second largest trading partner after the U.S. One quarter of Canada’s investment abroad is in the E.U., and ¼ of investment in Canada from abroad is from the E.U. – in sum amounting to half a trillion dollars, according to Jason Langrish, Executive Director of the Canada-Europe Roundtable for Business. Supporters say CETA will increase Canada-EU trade by 20 percent and boost the EU economy by €12 billion ($12.7 billion) and Canada’s by C$12 billion ($9.18 billion) annually. Health advocates take a less rosy view. They say the universal annihilation of tariffs will include those on processed foods and drinks previously taxed at more than 12%. This could lead to unhealthy foods high in energy, saturated fats, trans-fats, sugar, salt and refined carbohydrates becoming cheaper, says the EPHA. They hypothesize that, if cheaper, consumption could leap and rates of cancers, heart disease and strokes, type 2 diabetes and obesity spike. This in turn will exacerbate the burden on, and cost of, healthcare, and decrease the productivity of the European workforce. The E.U.-Canadian agreement has stirred debate, and been stalked by controversy and criticism throughout its negotiation. Protesters rallied outside the official meeting in Strasbourg, France as the deal was inked on February 15, saying it initiates the starting gun in a race to the bottom – driven by multinational corporations’ newly given right to intervene in public policy, and water down labour and environmental standards. The main point of contention is the deal’s system to protect foreign investors, known as the ‘Investment Court System’ (ICS) – or more simply, the creation of a parallel legal system where corporations can take governments to court for laws they feel inhibit their ability to compete in that market. The settlements reached here are called Investor-to-State Dispute Settlements’ (ISDS). In the past, through trade deals such as NAFTA, the creation of the ICS mechanism has led to regulatory chill and weaker environmental and health protections. The EPHA believes CETA is likely to inspire more of the same. And open the door to cases like Philip Morris International’s suing of Australia in 2011. The company notoriously sued the Australian government when it passed plain cigarette packaging laws, claiming the law would unfairly harm its sales – thus contravening their free trade agreement. Australia ultimately won the case in 2015, but not without years of legal battle and of course fees presumably footed by Australian taxpayers. Chemicals are one area of heightened concern, as the trade blocks permit different toxins within their borders – and their products and foods. So, implementation of any laws regulating EU-deemed “dangerous substances” in food, children’s toys and cosmetics that are included in the CETA agreement could be reason for Canadian companies to take the EU and Member States to court. While Canadians remain overwhelmingly supportive of the deal, 3.5 million Europeans signed a petition against CETA and its twin agreement, the EU-US Transatlantic Trade and Investment Partnership (TTIP).